The Poxed? The Pustule Pirates? The Weeping Sores? I'll think of a name later. 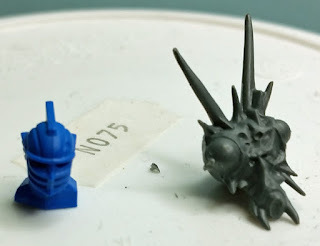 I suddenly found myself with a day for hobby.and so you would think I would leap at the chance to get something finished - the AdMech ZM force or the Militia Lascannon teams...instead I decided on impulse to start a Nurgle Blood Bowl team. This will be a rough and ready team knocked out to get some games in until Specialist Games release their team. 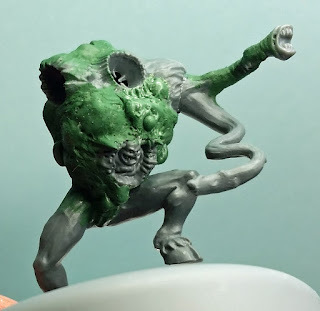 So the plan is to do this cheaply...I'll use a couple of Blight Kings as they are for Bloaters, I've bought some knackered zombies to be the base of some Rotters and some Beastmen are on their way to me to be converted into Pestigors. That leaves just one model to look at, namely the Rotspawn. Many moons ago (when Apocalypse was first released) I bought some Chaos Spawn and it was about time I put one of them to some use. Almost got him finished today, would have done if the glue hadn't been having one of those days when it never wants to sodding stick anything together. I used this body for the base as it has a more dynamic pose, giving the impression (I hope) of the Rotspawn charging forward into the opposition team. Might need to look at a different base though, need to check if a 40mm base will fit on the board. I used a spare Blight King belly to allow me to get some Nurgling fun into the team. The right arm is made up of four pieces. It is very WIP below (due to said problem with the glue).